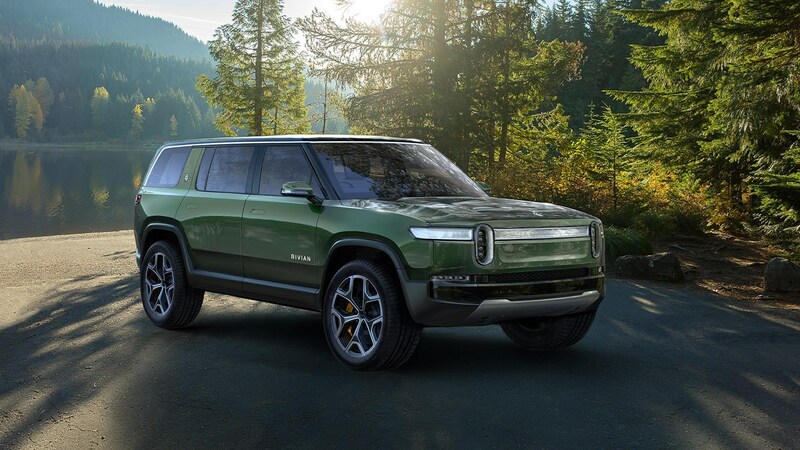 The Rivian R1S electric crossover was shown at the 2018 Los Angeles Auto Show - bringing a dose of family practicality to the EV scene. It's the sister car to the R1T pick-up shown earlier in the week. We'll be poring all over the Rivian electric cars in the coming hours, but these first photos show a box-fresh aesthetic, as the start-up attempts to persuade outdoors types to try out its new all-electric range. The R1S is built upon the same architecture as the R1T, but foregoes the long loadbed to squeeze in three rows of seats. 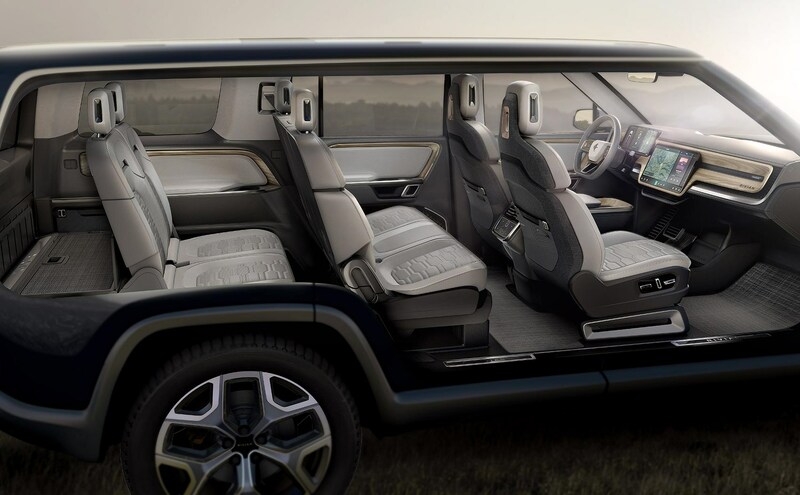 So you can seat seven and, intriguingly, Rivian has used some wipe-clean floors and materials, so you can hose out the passenger compartment in case your kids have trampled half the garden in. The interior boasts the usual spaciousness of an electric car: the chassis has been designed from scratch to be roomy and there are numerous cubbies and storage holes for the detritus of family life. 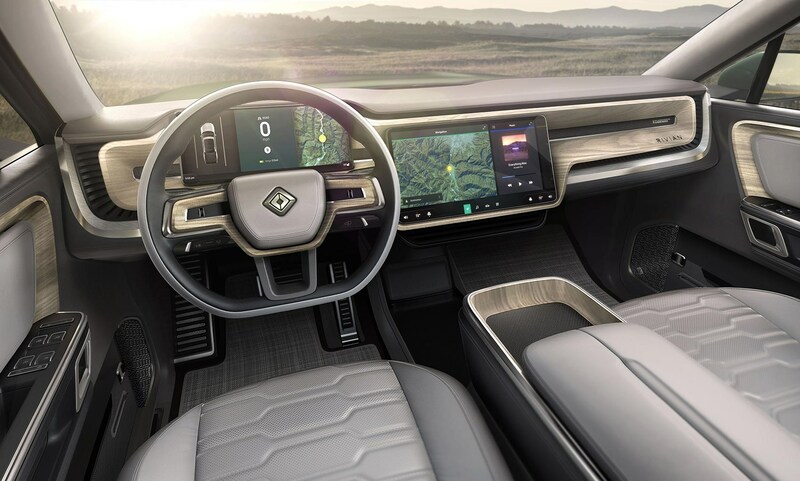 Note also the prominent digital touchscreens; Rivian is building its own infotainment system and engineers say they're modelling for an autonomous future where owning data and the relationship with your customers will be paramount. What's the range of the Rivian R1S? Like the truck, the SUV is based on the flexible skateboard platform, which packages batteries of different capacities. Pick from 135kWh or a whopping 180kWh at launch, and a more affordable 105kWh version will be launched within six months. Packing in a lot of battery cells is the secret to the 400-mile range. These are seriously capacious batteries - consider that the biggest Tesla today has 100kWh. Performance will be just as rapid as the pick-up truck; 0-60mph takes a claimed three seconds and each wheel has its own motor, for a combined - theoretical - total combined torque output of over 10,000lb ft.
Rather than showing off at the traffic lights, Rivian is keen to point out that the R1S has a seriously chunky towing rating of five tonnes. There's lots more to say about the Rivian R1S - so come back for more in a few hours when we've had a chance to pore all over the metal at the LA show.